After a good nights sleep the boys woke refreshed and ready for their long drive to the finish line ahead. Rolling Thunder decided not to drive East out of the city to see the massive equestrian statue of Ghenghis Khan; this decision was partly due to the time involved but more so because they knew there were precious few miles left in certain cars, particularly Vera! 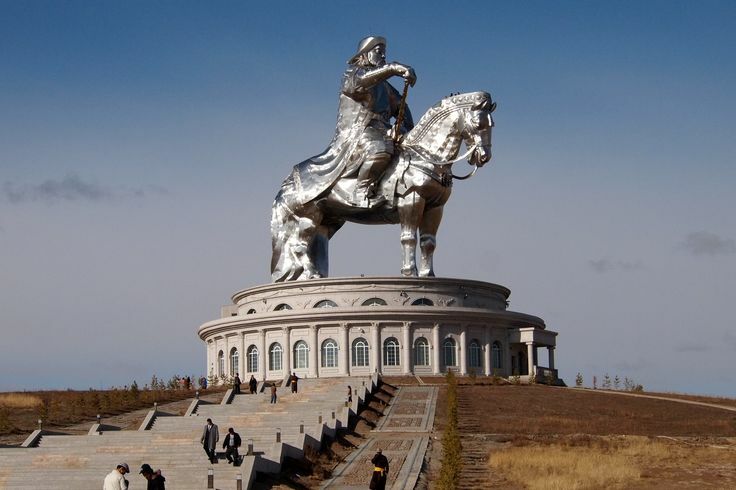 The boys turned down the opportunity to see the Ghengis Kahn statue. Instead everyone made their way to Revolutions where they all had the best breakfast of the trip, an English style fry-up! The boys then had a relaxing afternoon browsing shops and they actually bought some stamps for the postcards they had bought back in Uzbekistan (car troubles had punted postcards down the list of importance!). The whole convoy went out for a lovely meal that evening to an american style sports-bar, which was a lot of fun. Once again large amounts of food were consumed, Duncan and Dan took on a rather large plate of sushi! The convoy had agreed to leave after dinner, in an attempt to miss the rush hour out of town. So the next stop was the supermarket to stock up on essentials for the final leg of the trip. 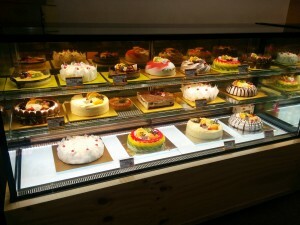 The boys contemplated buying a cake from the supermarket! As the boys approached the supermarket they saw a someone they didn’t expect to, it was Ben from The Spare Parts! He was sitting on the wall waiting for Matt and Ozzie to return and was rather irate about where they were, he did seem very happy to see the boys though. Soon afterwards the other two turned up in their Clio, with Sven the reindeer still on the roof, and one of the founding members of Rolling Thunder was back with the convoy! After they had packed their cars up the convoy rolled out of Ulaanbaatar, the convoy was now 6 strong (CCBB, Aston Micra, The Spare Parts, Haggis Hunters, The Baked Potato(es) & Yorkshire Special Branch). As it should have been Duncan, Henry and Matt were all in Vera for the final leg. Everyone had thought that by the time they left, 9pm, the rush hour would have subsided, but they were in for a shock. Four congested lanes of traffic and some rather poor signage made getting out of the capital a right nightmare. This was not what Vera needed, somehow she made it out of the city without overheating (probably because it was now dark) but 3rd gear was now becoming almost impossible to engage and the whole car lurched off to the right when changing up a gear, she was begging for mercy but the boys just needed her to hold on for one more all-nighter. Just outside Ulaanbaatar Vera’s exhaust gasket (the one the boys had repaired in Romania) went again and she sounded like a motorbike once more. A little further down the road, Yorkshire Special Branch’s Vauxhall Agila had a cooling issue so everyone stopped to take stock of the situation, they had made it out of the city but that was just the start. Driving Vera had now become difficult to say the least but Matt ploughed on, trying his best to avoid pot holes whilst keeping his eyes on the edge of the road for stray animals. 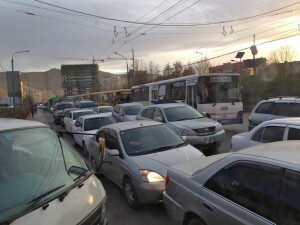 As when entering Ulaanbaatar there were a lot of slow vehicles on the road (tractors, heavily laden trucks etc.) so the convoy also had some overtaking to do in their beaten up, under-powered wreckmobiles. This inevitably meant that they got strung out along the train of traffic. This situation wasn’t improved either by Aston Micra’s shambolic headlights. CCBB, leading the pack (that had shrunk to 3, themselves AM and TBP), decided they would stop at the next filling station just after a toll booth to regroup the convoy. They couldn’t quite believe their eyes as they pulled in to see Tim and Ida having a break in the forecourt too! Jen said she needed to have a sleep and couldn’t carry on, the boys offered to drive for her but she wanted to finish by herself so they wished her good luck and drove off into the night with the Micra and their Swedish friends in tow. The Swede’s Hyundai had by now completely lots it’s exhaust and sounded absolutely epic!